On the 25th June 1999 in the Tararua Ranges north of Wellington, a body was discovered with a single gunshot wound. 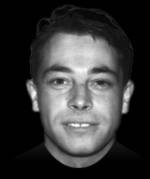 The body was identified through fingerprints as that of Trevor Heath (aka Terri King) aged 31 years. He had been shot in the head. Crime.co.nz have met and talked with family members of Trevor Heath. With their agreement and support we now offer our readers an insight into the young man, whose name has made headlines through the most tragic of circumstances, his own murder. The family was very upset to find that most of Trevor's personal and work-related possessions had been taken from his residence after his murder by persons unknown.